Michael Johnathon and The Ohio Valley Symphony. 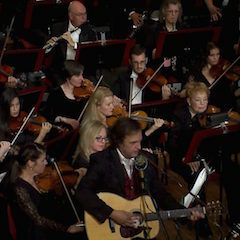 Folksinger Michael Johnathon and The Ohio Valley Symphony celebrate the music and stories of America's front porch, from Appalachia to Woody Guthrie, Buddy Holly to George Gershwin, Irving Berlin to Vincent Van Gogh and more. Conducted by Tim Berens and recorded at the historic Ariel Opera House in Gallipolis, Ohio. Aired worldwide on the 500+ radio stations of the WoodSongs affiliate family plus the American Forces Radio Network.